Troye Sivan has established himself as not only a brilliant musical artist, but as a forward-thinking visual artist as well. Through each of the three videos from his latest Universal Music release Bloom, “Dance to This,” “My My My!” and the title track, the Australian pop star has shown that he has a clear vision for how he wants to present his music to the world. With Sivan having such a vision, streaming service Pandora wondered what would happen if he were tasked with turning his music into art in a live setting. They asked the 23-year-old singer to create various paintings that represent Bloom’s sound in a new video. Before starting, Sivan said, “Quick disclaimer: never painted anything in my entire life up until right now, so this will be interesting.” Watch the video below. 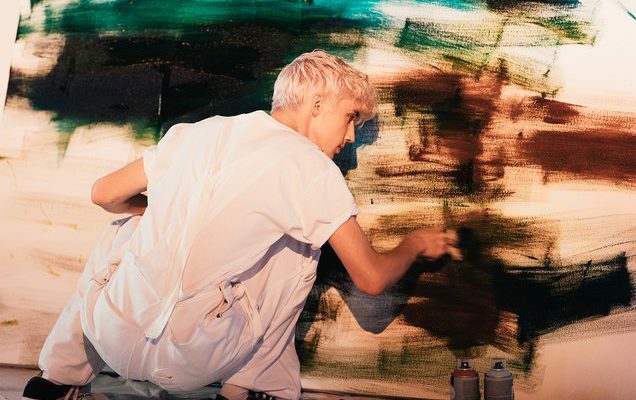 Though Sivan’s creations may not be the cover of his latest album (as he wished they would have been after finishing), his Bloom-based masterpieces won’t go to waste: The artwork Troye painted will be donated to LGBTQ charity Ally Coalition.